THE CURIOUS CORNER OF CHAMAREL CURIOUS OR NOT? renowned UK artists/designers, as well as a genius called Edward Gray, who did a truly amazing job. 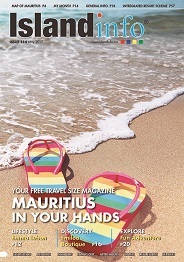 WHEN DID YOU OPEN TO THE PUBLIC AND WHY MAURITIUS? climate. The site has wonderful green vegetation that has provided the Curious Corner of Chamarel with a beautiful tropical garden setting for our café and boutique. Chamarel is also home to one of the world’s great natural ‘curiosities’ - the iconic Seven Coloured Earth, so it seemed an obvious location for the Curious Corner to be situated. HOW HAS THE PUBLIC RESPONSE BEEN SINCE YOU OPENED? visiting with their kids being “the kids enjoyed it loads, but we enjoyed it more”. WHAT IS YOUR ‘STAR’ PRODUCT? That would be telling! Everyone has their own favourite. One of the great things, is talking to people who have visited and seeing how different people like different exhibits. But the ‘world’s best mirror maze’ is close to the top of our visitors’ lists. There are multiple interactive attractions and some fantastic photo opportunities for capturing some weird and wonderful memories. The goal of our company is simple – for all our visitors to have a truly unique and enjoyable experience and go away with a great big smile on their face and ‘curious’ look in their eye. Please pay a visit and you will find out! ANY CLOSING COMMENTS FOR US? appreciate the generous support we have received from the many ‘curious’ people out there. I personally and on behalf of my partner would like to say well done and thank you to all the Curious Corner of Chamarel staff, for their fantastic efforts in helping to create the ‘CCC Experience’. We have received some fantastic comments from many many visitors – so congratulations, thanks and keep it up.